I'm sitting here doing work from the National Library in Singapore. I'm doing a slower type of travel where work most of the days. Then on weekends or evenings I go out and explore (or just whenever I need a break). If there is a library around, I like to check it out as an alternative to working from a cafe. It also gives me another perspective into the culture of the city (who is at the library? students or workers? What are they generally working on? How clean is it? etc.) Anyway I'm not here to go into those details today. But instead I wanted to share an observation and prediction about libraries. 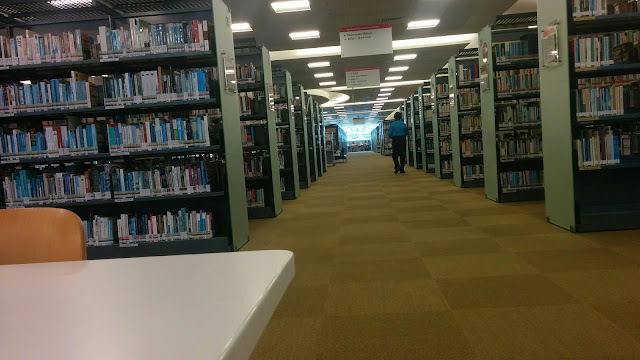 In this library each floor (not sure how many floors but most floors seems to have this structure) consists of about 5 large tables (16 chairs each) at each end. The tables themselves were almost completely packed most of the time and I had to walk to a few ends in order to find a spot. But the main thing I noticed were that the centers were filled with large shelves of books. But the entire time I noticed zero people walking around the shelves picking out books. Every single person is at the desks of the libraries with there laptops or study material. So effectively 80% or more of the space is dedicated to books that noone uses. View From One end of the Library to the Other. You can (barely) see the desks at the other end. 1) We are moving to digital. If you need to find some information, you will probably find the information you need online. This is more efficient. Even books themselves are being digitized. If you found this blog (everyone) then I don't have to explain. Yes there is information in books that is not on the internet and that will probably always be true but that is the EDGE case. Not the main case. So its not a good argument for having all these books sitting here taking up valuable space. 2) There is an argument that people still like to hold and read a physical book. And that's all good and well. In most cases (like if Im not travelling and don't want to lug around a book), I'd prefer the physical book to reading an ebook off of my Kindle. But, the Kindle experience isn't much worse if at all. And I believe this is a general opinion as evidenced by the rising # of ebook sales and the dying print magazine industry. There will always be laggards like the guy who still owns his flip-phone until he is dragged into modernity because it is no longer supported. That's what I think will happen to books. So what about libraries? Well I think they will change rather than die. But very slowly. The first thing to remember is that they are supported by tax money so they won't feel the immediate hurt by people using the books less because they get their tax money either way. But I do think the people running the libraries are thinking about the public and the best ways to serve them and will take notice of the trends. What will they change to? I think libraries will be more akin to a coworking space. This seems to be what 95% of people are using the space for anyway. Every single person here is at a desk studying. About 80% seem to have laptops (every single person at my current desk has one). Looking around I see 1 person just sitting and reading a book. The libraries will eventually cater to the 95% of what people are already doing instead of the 5%. The process will be slow since it takes time and the pressure to change isn't high, but it will happen.